I'd like to add that I too am getting sound crackling issues on Avast IS. Like everyone else here, LatencyMon reports ndis.sys as being the culprit, yet despite various changes to my hardware that I have tried making, the problem still persists. Considering it doesn't matter if I'm on Wi-Fi or ethernet, and the problem only manifested after updating to 2015, I'm pretty strongly believing that it's Avast at this point. EDIT: Now certain that this problem is with Avast's Firewall. After getting major audio pops from any web activity at all, I uninstalled Avast's firewall (only) and without restarting all my latencies returned to normal and the popping ceased. Not good, Avast! I've never had latency problems with your firewall before, so this is quite unexpected. Since reinstalled to see if the problems return, but not optimistic. I can confirm severe audio crackling, random audio delays and sync issues, running avast free 2014/2015 on both Windows 8 and 8.1 the past few months up until about two weeks ago. My soundcard is an external firewire card, Focusrite Saffire Pro 24 DSP. Using latest drivers for it, all windows updates fully installed, all drivers on my system up to date constantly. Have had the problem after fresh installs of both Windows 8 and 8.1, and also after Windows has been installed for more than a month. High DPC latency (both GPU related drivers, ndis.sys and something else Nvidia related). Not running avast firewall, only windows firewall. However, I haven't had any issues the past two weeks or so. Maybe it is fixed? Hello... Hola, cierto que el firewall de Avast internet seguridad provoca latencias, audio interrumpido, micro-congelamiento de imagen, flecha del raton erratica, etc., desinstale el firewall y se soluciono completamente, vuelta a la normalidad. ¿Sabeis si se estan buscando soluciones?, me gusta Avast y quiero seguir usando la suite completa. Un saludo. Use google translate, non worry. Bye. 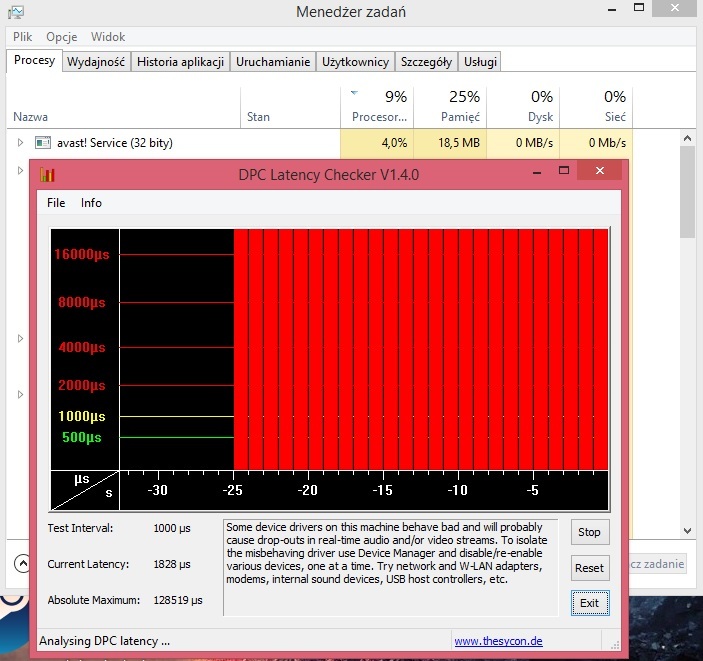 Also have problem with DPC Latency. Uninstalled Avast Internet Security and problem is gone, wiped away. Avast guys please resolve this issue.. In my mind, they can't fix it. Looking like they just ignore it. I have this bug on all my PC, include notebook msi ge70. I've also had this issue for about a year. I would have to reboot every day or two because it would get progressively worse to the point that the video would just freeze while the audio stuttered for 1-3 seconds. About 6 months ago upgraded my PC. To my surprise the problem followed. I've updated drivers, disabled hardware, uninstalled programs -- but never really thought about Avast. Well 3 days ago I removed Avast and I've been problem free ever sense. Not a hint of any DPC latency. Has anyone had success in simply removing the firewall component of Avast by using the Avast entry in Programs and Features? THANK YOU ANYONE IN HERE !!! I finally resolve all my latency problems !! On Win7/64bits. Definitively it was the Avast Firewall that created it, I've tried so many other options without success. For the record you can remove the Avast Firewall only by choosing to modify Avast in the Add/Remove Software section. I will be forever thankful on this one. This problem poped up without no reason (maybe an Avast upgrade? but I read that the problem was older then that and barely unfixable. Anyway. It worked for me. Same issue. I'm using Avast 2015.10.2.2218. I was using Avast Free Antivirus. A few days ago, the program offered to give me a 21-day trial of Internet Security. I enabled it, and immediately the problems started. 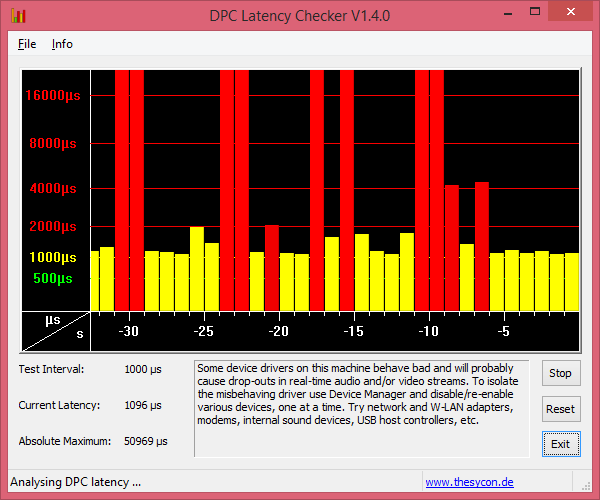 Tons of DPC Latency, audio and video skipping. I have an SSD with 32gb of memory on an AMD A8 so there's really no reason this should be happening. At first I thought maybe it was a Windows Update or a Chrome update, so I used Window Performance Analyzer to chase down the problem. The latency was being caused by the network drivers, WPA listed ndis.sys, tcip.sys and netio.sys as the culprits. I am using the latest driver available from the manufacturer for my Qualcomm Atheros 8151 NIC. So I did some digging and found this thread. I ended the Internet Security trial, rebooted, and immediately the problems went away. I'm back to playing 24/192 audio with dozens of 64-bit Chrome tabs open - no problems at all, as before. This is a real shame as Avast Free AV is a great product. I'm a freelance IT consultant, so I definitely won't be recommending my customers pay for Avast. Eset is the best paid option anyway, but of course it's much more than $20 a year. It's really sad that this thread has been open for nearly two years, and no response from Avast, nor apparently any attempts to fix the issue either. Fail! Boy am I glad I found this thread. I was going crazy because of the constant audio stuttering. I ended up uninstalling the firewall from the Internet Security package and only kept the antivirus. Thanks for your description of the problem. We moved the problematic parts of code from DPC to passive level. Our tests looks right. The fix will be in the next version. Seriously. I remember reporting and debugging this issue with Comodo a few years' back. They fixed it ages ago and never had this problem since. Just recently thought "hey, I've been using free Avast for years, might as well give them a little cash", uninstalled Comodo, bought Avast IS with the firewall. The long-forgotten DPC issue is back. Seriously, fix this thing. My sound stutters like crazy, even chopping the video. Confirmed using dpclat. It does not look good at all. EDIT: Here's what happens if Avast tried to do something in background after PC has been running for over one day. Mouse cursor stuttering. Unusable PC. Had to reboot.